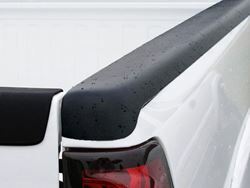 Protect your pickup bedrail tops from scratches and dings with Stampedes extra tough heavy duty Smooth finish Rail Topz. These high-strength bed rail caps are made exclusively with Tri-Blend ABS material that is so tough it is backed by a lifetime warranty from Stampede. These bed caps are easy to install with 3M automotive grade tape. Stampede bed caps will not fade in the sun and can stand up to the harshest weather conditions.